Hello Surfer! Are you looking to advertise your web site business? Do you want to bring new, fresh, people to your affiliate program? Fast and Easy here at Real Time Auto Surf. We are a simple and easy super traffic generator. We are a free auto surf traffic exchange. In just minutes, you can bring fast quality traffic, Sign up is free! Don't forget when you surf you can earn prizes. When you join, we will give you a promo ad package to get you started, with 5K credits and more for FREE! Build your Traffic Rating! Limited Time Surf for Random Cash Rewards! Real Time Auto Surf is a Brand New Site, look for special offers Inside! We have Super Surf Ads - Reach a network of over 90+ ad sites in a single click, with 200 credits each! 123-456 Credits Earned for Clicking Earn Daily Credits, Once a day. 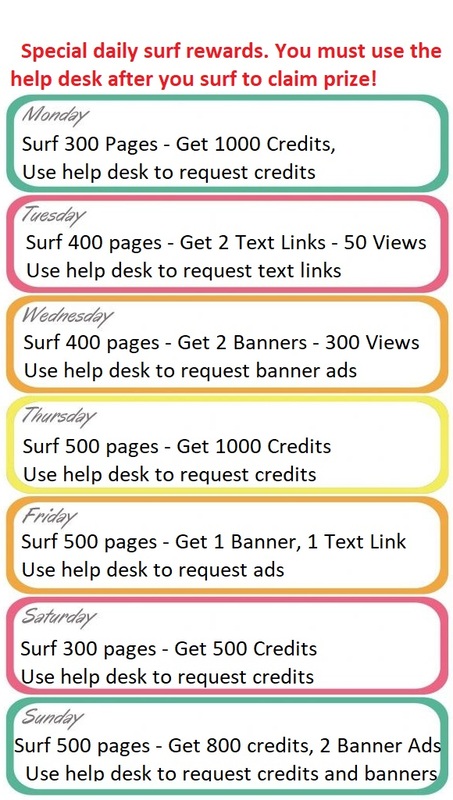 Earn extra Credits each 100 pages surf. Daily Surf Specials - details inside! So what are you waiting for? Join Right Now your sign up ads are waiting for you and look in the members area for a Extra Special Promo Code!